The Zeiss Mineralogic system is split into three sections (Mineralogic, Mineralogic Explorer and Mineralogic Reporter). 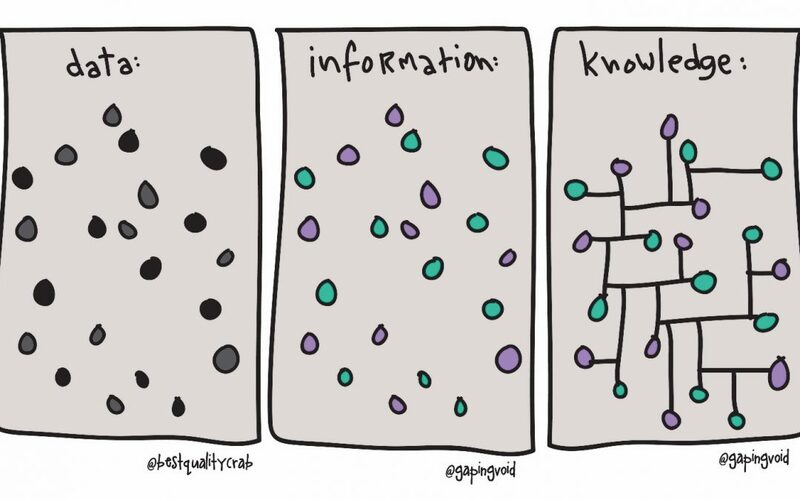 They cover three distinct areas, namely; (i) the collection of data, (ii) the analysis of the database, and (iii) the reporting of the results. The last of these is the focus of this article. Mineralogic Reporter has been designed by Petrolab and Zeiss and is focused on the efficient extraction of information from the results database. The first step is to select the samples and the relative proportions – it is particularly important with reconstructing samples from individual size fractions to get their relative proportions accurate. Once the samples have been selected the Mineral list used within the database can then be simplified as desired (e.g. If the sample contains trace amounts of minerals such as zircon, ilmenite, monazite, and these aren’t relevant to the overall job, then they could be grouped as “Accessory Phases” – as below). A similar example is shown below for a Cu project where bornite, chalcopyrite and chalcocite were the primary Cu-bearing minerals but where there were a host of trace Cu minerals that cumulatively contained a small proportion of the overall Cu – these were grouped together as “Accessory Cu Minerals”. Once this architecture is set-up the graphical outputs can be created, and there are three primary outputs; (i) modal mineralogy, (ii) elemental deportment and (iii) liberation. As part of the design of Mineralogic reporter the results of the individual fractions are also reconstructed and displayed. 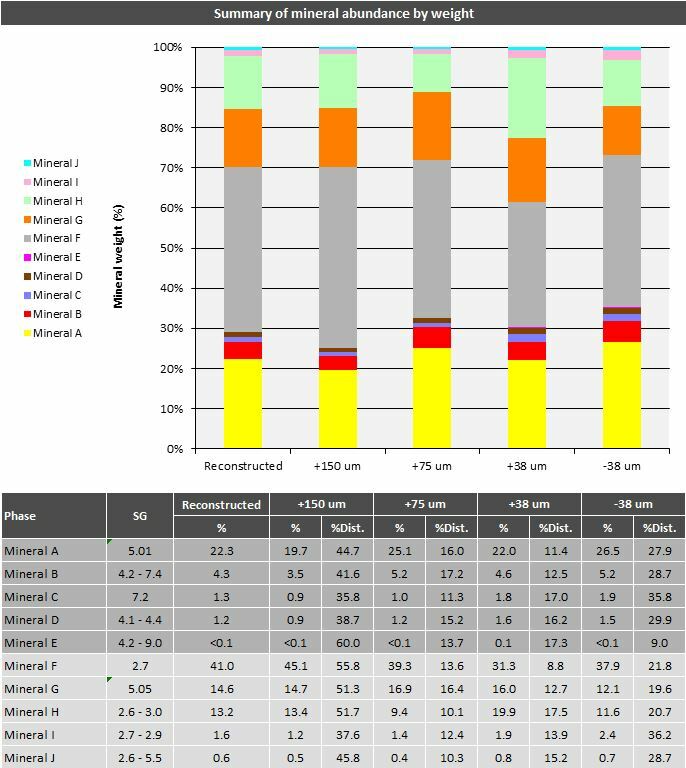 The target phases for this analysis were minerals A, B, C, D & E. The remaining minerals (F,G,H,I & J) are associated gangue phases. The bar charts are arranged with the target phases at the base and the gangue phases following on above. From the example below it can be seen that the target phase showed a slight preferential concentration into the fines. Along with the individual results for each size fraction and the overall reconstructed value for the sample there is also a calculation given for the amount of each phase in each size fraction as a proportion of the whole sample (i.e. in the sample below this takes into account the high mass proportion of the coarsest size fraction). Using the mineralogy above it is possible to calculate an elemental deportment and a recalculated grade. 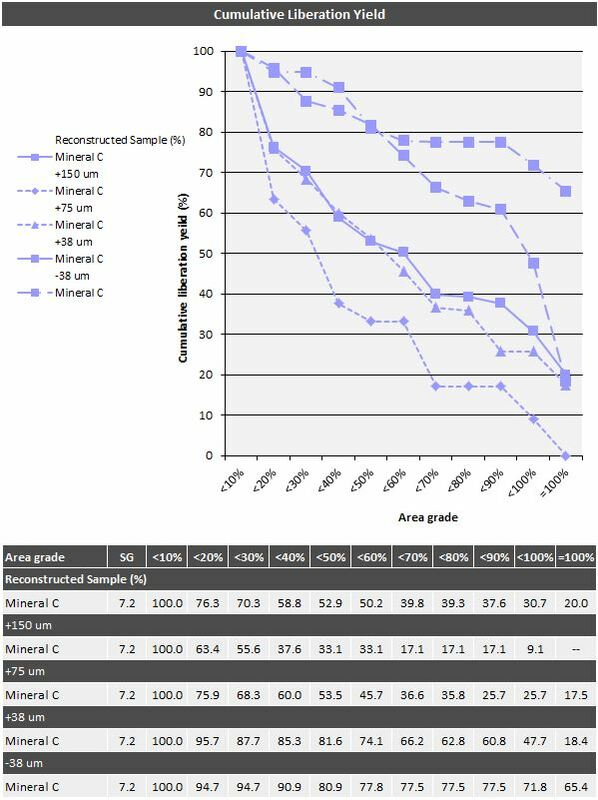 As shown below Zn is primarily hosted within Mineral D with some minor accessory concentrations in mineral B, A and G. The recalculated grade for the sample is 0.6 wt% with a slight increase into the fines. Along with reconstructed values for the overall sample, each size fraction contains a recalculated grade value, and a calculated distribution value (i.e. the amount of Zn present in that size fraction as a proportion of the overall sample) – as with modal mineralogy this distribution takes account of the mass proportion of each size fraction relative to the overall sample. Liberation analysis on particulate matter is a fundamental tool for determining grind size parameters in pilot processing or for understanding possible sub-optimal recovery performance during processing. There are two types of liberation analysis, either area-grade or by partial perimeter (see below). 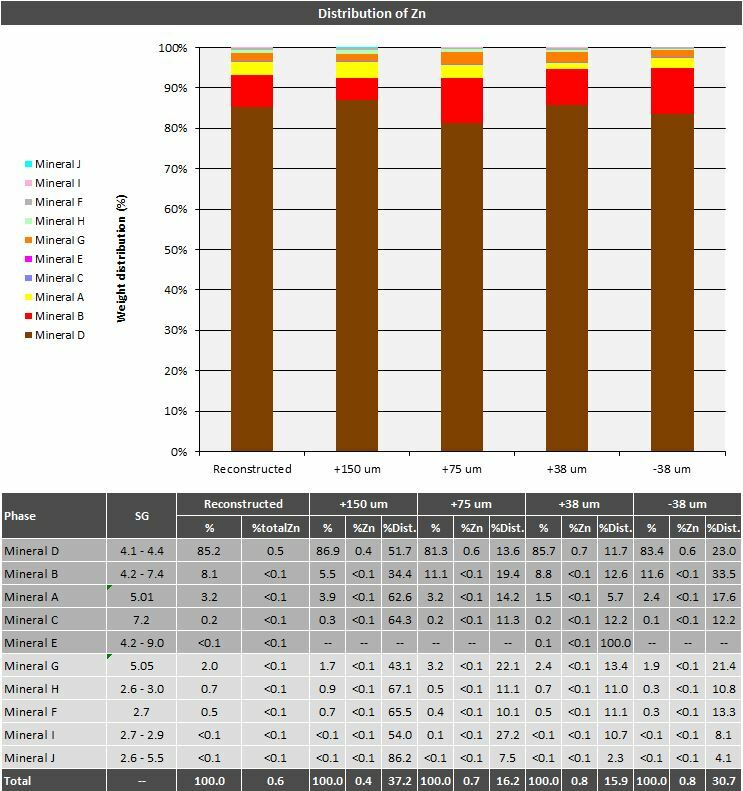 For simple mineral textures area-grade and partial perimeter assessments will produce similar results but in complex textures there can be substantial divergence. Mineralogic can calculate either from the available database and it depends upon the pilot process in question as to the most appropriate measurement technique. Area grade assessments are best for gravity concentrate processes, whereas partial perimeter assessments are best for leaching or flotation processes. Area grade liberation vs. partial perimeter liberation for the same composite particle. 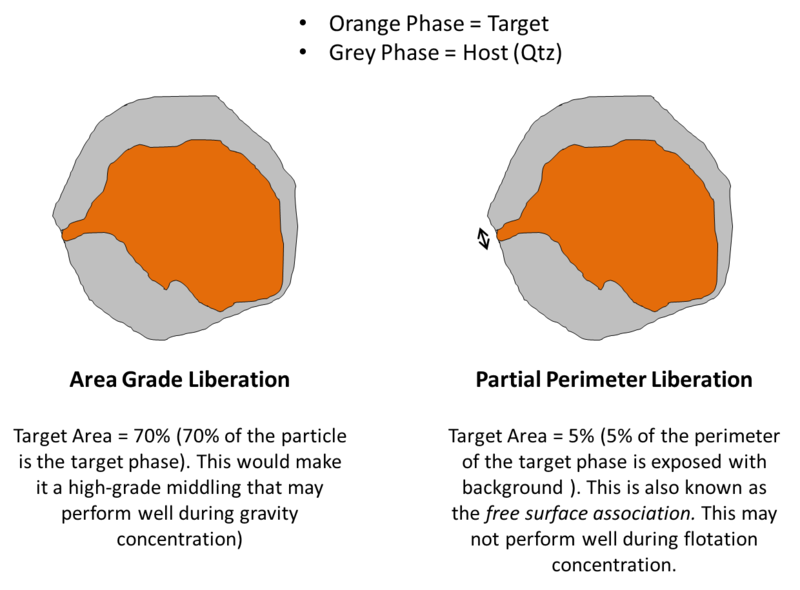 The example below shows how liberation varies by grind size for the sample above. As expected the finest size fractions show the greatest extent of liberation (i.e. curve closest to the top right of the graph) and the coarsest size fraction shows the least liberation (i.e. curve to the lower left). The overall reconstructed liberation (bold line) is moderate. This was done as an area grade assessment because the commodity in question will be concentrated up using shaking tables. Example mineral liberation for mineral C.
These are the core outputs of Mineralogic reporter but in addition to these there are numerous other information outputs that can be calculated from the database. As standard, these would include grain and particle size distributions (by weight%), mineral association data (calculated as the mass proportion of the target phase in association with particular minerals), mineral recovery curves by particle size class and traditional grade-recovery curves (which are slightly different from cumulative liberation yield curves). These are calculated separately through the MySQL workbench. Altogether, the information extracted from any Mineralogic run is very useful to solving questions arising from pilot plant processing. The development of Mineralogic reporter has further expedited the efficiency with which this can be done, allowing for the effective reconstruction of separate size fractions into a sample whole and the rapid output of modal mineralogy, elemental deportment and cumulative liberation yield.